This technology dates back to the 1940s when it was originally developed during the 2nd World War to be to show when food rations had been exposed to excessive temperatures. Today the small number of original temperatures has been greatly expanded upon. The technology itself works on a microcrystalline wax being milled into a water-based dispersion with a white appearance and this is then either coated or printed onto a coloured absorbent paper (normally black). These are then formatted between layers of high temperature plastics and adhesives so that when its temperature rating is achieved or exceeded the wax melts and is absorbed into the coloured paper giving a change from silver white to black when a polyester film is used or an amber to black change when a polyimide film is used. These are irreversible and can be used only once. The waxes melt over a relatively sharp range of temperature and can be formulated to react to many temperatures between -17°C (1°F) and 290°C (554°F) and react to changes in temperature as small as 0.2°C (0.4°F). Accurate to up to +/- 1°C to 100°C, +/-1.5°C to 150°C and +/-1%+1°C across the rest of the range if stored and used correctly. 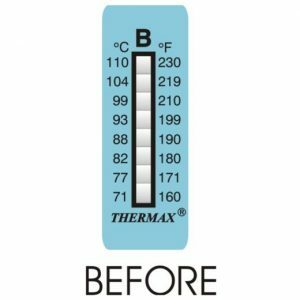 Each temperature on the label is individually formulated and laid down to form an independently functioning temperature indicator. 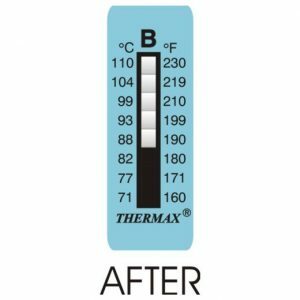 When placed alongside other formulations a graduated scale can be created allowing the user to identify maximum exposure temperature. The highest segment that has changed should be read one that should be read. The above values are only guidelines and should not be relied upon as they can vary depending on the product. Temperature up to 49°C (120°F) 6 months from invoice date when stored in a refrigerator. Due to the nature of construction we can produce these in most designs or shapes and a full custom manufacturing service is available meet customers’ precise requirements. Please contact us for details.